Learning to scuba dive is a lot of fun. It seems that everywhere I go, people tell me that scuba diving is “something I’ve always wanted to do.” The great thing is that learning to dive is easily within reach of just about everyone. For most of us, it all starts here. During your PADI Open Water Scuba Certification course, you’ll learn and gain mastery of the essential skills for safely entering the underwater world. The course offers a combination of classroom, pool and open water training, so you’ll be comfortable and ready to get wet and begin exploring in just a few short weeks. Believe it or not, you can learn to dive any time of year. Winter classes, at least the Open Water part, can be chilly, but still a lot of fun. We plan for the cold by wearing the proper exposure suit, and keeping dives short enough that you won’t be uncomfortably cold. Winter diving is great, often providing the best visibility of the year, but if that’s not your thing, you can do the classroom and pool sessions here, then finish with your Open Water Dives on vacation! Imagine earning your open water certification by exploring warm, tropcal ocean reefs! The great thing about diving is that the learning never stops, and the adventure never ends. Once you become an Open Water Diver, you’ll be forever changed. Your vacations will take on new meaning, and you’ll choose destinations based on possibilities you never imagined. It’s great! 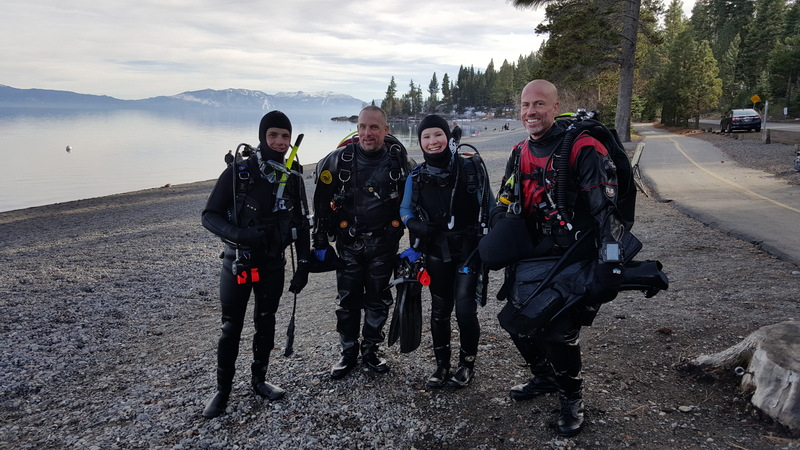 Adventure Dives are your chance to experience deeper water, make underwater videos, even dive at night–all the while, working toward Advaced Scuba Certification! There are literally dozens of PADI Adventure Dive possibilities. By joining in the fun, you extend your capabilities and meet people who share your love of diving. This is a great thing to have here in Reno! I’ve wanted to learn scuba diving for decades now, but have never actually done it. I think this summer is the one that I do it finally. Hi Joe I am curious if we could get my husband certified before we leave on October 26 to Fiji. We live in Elko and he works for the mine so he has a crazy schedule. What would this cost and would it even be possible? Thanks!! We’re going to Puerto Rico over Christmas and would like to get my son diving lessons. He lives in Reno. We’ll be there on June 24th and would like to surprise him with a visit to your dive shop. He’s 33 and has never done anything like this before. Would like some prices and how do we go about getting him started. I can’t imagine going to Puerto Rico and not diving, so your son is in for a great experience! I teach at Sierra Diving Center, but I don’t deal with pricing at all. I think the course is around $300, plus a few other costs, but I’m not positive. Also, there are different rates for private or semi-private classes. At the risk of sounding biased, Sierra Diving Center is by far the best place to learn in our area. The shop has been in the area for around four decades and Keith Chesnut, the owner, is known worldwide as a leading authority on diving safety. If you’d like to get your son signed up, simply call the shop at 825-2147. I’d be happy to teach him personally. You just need to ask for Joe Ross when making arrangements and they’ll set it up as long as the scheduling works out. Other than that, it’s just a matter of getting stared. The advanced course is a lot of fun, since mostly you’ll be gaining experience doing different types of dives. Five dives are required, two of which must be a deep dive and a navigation dive. The best thing is just to relax, pay close attention to your instructor, and just have a good time. If you live around Reno/Tahoe, I often organize dives in addition to the monthly fun dives that are run by Sierra Diving Center where I teach. Anyone interested can drop me an email or fill out the form on the right of this page and I’ll keep you in the loop.